According to Dictionary.com, Salvation is: 1. the act of preserving or the state of being preserved from harm: 2. a person or thing that is the means of preserving from harm. When a soldier goes into war, they wear a helmet to protect their head from injury. As a christian, we need to put on the helmet of salvation every morning to protect our minds from the lies of Satan. Satan is the great deceiver and wants nothing more than for you to believe that you are worthless, that you will never amount to anything, that no one loves you, that you are unimportant, that you are bad, and that you are hopeless. Satan plants these lies in our minds to keep us from believing in the mercy and love of our Savior, Jesus Christ. The definition of salvation tells us that it is an act of preserving from harm. It is also, a person or thing that is the means of preserving from harm. Romans 6:23 tells us that the wages of sin is death. What can be more harmful than death? Who is that person who preserves us from harm? What is that thing that keeps us from dying in our sin? Romans 6:23 tells us that the gift of God is eternal life in Christ Jesus our Lord. Our salvation is Jesus. Jesus and only Jesus keeps us from dying in our sin. He is the ONLY one that can give us ETERNAL LIFE! When you put on that helmet of salvation in the morning, you are putting on the identity of Christ. Not that we will EVER be Christ, but can become Christ-like in our daily lives. Satan lies, but Jesus is truth (John 8:32). When you dig into the Bible and the truth of Jesus starts to penetrate your mind, you will realize that you ARE worthy! You WILL amount to something! Jesus loves you! You ARE important to God! You are good! You are HOPEFUL! This is the truth of Jesus. Put on the helmet of salvation. Know that Jesus loves you so much that He died for your sins. He loves you so much that He wants you to have eternal life with Him. Jesus loves you so much that He does not want you to die in your sin. He gave His life for you! He gave His life so that YOU may live. Jesus is our salvation. Believe in Him and you will have eternal life (John 3:16). Put on the helmet of salvation. Know who you are in Christ. Let go of the lies of the enemy. You are AMAZING because JESUS says so! If you are searching for the truth. If you are seeking a relationship with Jesus. If you have been torn down by the lies of Satan and you are ready to break free, contact me. I would love to get to know you and pray with you. Jesus loves you, my friend. I am here to help you in whatever way I can. One of the first things we all do when getting dressed is put on our shoes. We all wear shoes, why? Most of us wear them to protect are feet from injury. Athletes wear shoes specific to their sport to protect their feet. As a diabetic, one of the most important parts of maintenance is to examine our feet on a daily basis. I was scolded by my doctor at a routine doctor appointment for wearing flip flops. It was Summer and I hate wearing shoes, period! She told me that I need to wear supportive shoes and socks. As long as we remain in Christ Jesus, we will experience the peace of God. Walking in peace means that no matter what chaos the enemy throws at us, we know that greater is He that is in us, than he who is in the world (1 John 4:4). God is in control. We can live our lives without worrying about what might happen, because we know that the God that created the universe is in control of everything that happens in HIS creation. Nothing escapes His notice. We can walk in peace, knowing that Satan has already been conquered. Another way we can shoe our feet with the gospel of peace is to walk out peace in the world. One of our main objectives on this earth is to be the hands and feet of Jesus. Jesus walked in peace. Jesus brought peace to those He ministered to and we need to do the same. When people walk away from us, they should walk away with a sense of peace, not chaos, anger, or fear. We are to be experts in conflict resolution, finding a way to bring a resolution to an issue, not adding fuel to the fire. When we look at a situation the way Jesus would, we are more willing to let go of selfishness, anger, hatred, bitterness, greed, etc. We become willing to look at a situation from someone else’s perspective, instead of just our own. I encourage you to remember to, shoe your feet with the gospel of peace, every morning as you get ready for the day. Walk IN peace, knowing that God is in control and walk OUT peace in your sphere of influence, bringing peace where there may otherwise be chaos. My ex-husband is a former Marine and decorated Veteran. He received the Bronze Star Medal of Valor when he returned from the Persian Gulf War in 1991. He has shared many war stories from the time he spent in Iraq and Saudi Arabia and I understand that his survival depended on his preparation. We are in a spiritual war. The devil is lurking around every corner, in every doorway and under every rock, trying to trip us up. He will stop at nothing to get us to turn away from God. He has declared war on God and wants us to join him. It is a real spiritual battle and we need to be prepared! How do we prepare for spiritual warfare? 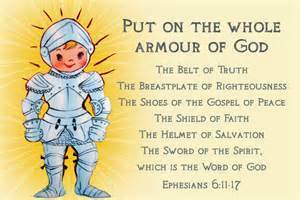 We put on the armor of God. The first step is to put on the belt of truth. John 8:32 tells us that the truth will set us free. What is the truth? Jesus said that He is the truth. Without Jesus, we don’t have access to the Father. We need to know Jesus, really know who He is. We need to communicate with Him, serve Him by serving others, and love Him by loving others. We need to read the Gospels until we exude the heart and soul of who Jesus is. When a weight lifter is preparing to lift weights, he girds his waist with something that gives him strength and support so he won’t hurt the core of his body. When we put on the belt of truth, we are providing support and strength to our spiritual core. Jesus is that strength and support that we need in our spiritual core to survive the attacks of the enemy. When we buckle the truth of Jesus around our waists, we will be prepared to deflect the arrows of Satan. I am challenging you to gird your waist with the belt of truth every morning, carrying Jesus with you wherever you go. Do this and Satan will have to flee!